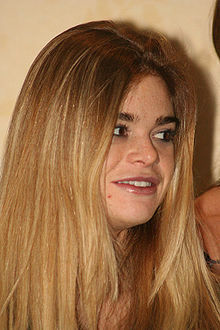 Ellen Muth (born March 6, 1981) is an American actress. She played young Selena St. George in the movie Dolores Claiborne. She also played Katie Trumbull in Margarine Wars. Muth was born in Milford, Connecticut. ↑ "Ellen Muth". Biography World. Retrieved June 21, 2014. ↑ "Ellen Muth". Film Reference. Retrieved June 21, 2014. This page was last changed on 21 June 2014, at 13:16.